I have a module in Access to format cells in an Excel spreadsheet. It works, but it gives a pop up to confirm saving the file (obviously not what you want when trying to automate something). When I change the code to use "Application.DisplayAlerts"
I am new to VBA coding (obviously), can anyone help me resolve this? Thanks! a) You are accessing an Excel workbook from Access without creating or "catching" an instance of Excel application first. c) You are using Selection for an operation that does not require selection. e) You are using "Save As" even though you are not saving in a different path or with a different name. Make sure to set a reference to Microsoft Excel. 3) there is no conflict between used types of excel objects (as Workbooks, Range, Columns) and types in higher referenced libraries. 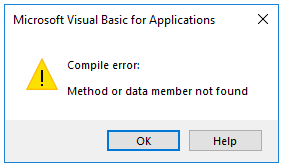 When you call Application, access vba assumes you mean access application, so the error. Verify the sheet you plan to format, your code works with active sheet (that can be random and depends on the selection on saving), MakeItSo assumes first. Thank you MakeItSo for the explanation and the code. It worked perfectly! You too combo, thank you for your comments!